In twelve wise, stimulating essays and lectures, a noted Columbia University scholar examines today’s declining culture. Ours, he observes with disgust and discernment, is a period of specialization in which the “torrent of information” compiled is unnecessary, in which college students are diverted to the “minutiae of analytic methodism,” in which the over-production of art has made us into “gluttons who gorge and do not digest.” Barzun examines aspects of literary and art criticism, retrospective sociology, the abandonment of intelligibility, the “rhetoric of numbers,” the effects of relativism on moral behavior and the differences between Art with a capital A , “high art,” public art and domestic art. He avers that the oversupply of fine art increases the need for subsidies; yet, although we pay farmers not to grow crops, we do not pay artists to stop making art. 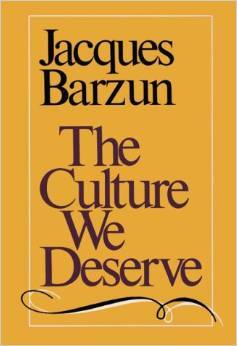 Still, Barzun is consoled by the realization that as long as humans exist, there is hope for “new” civilization and all its works. ~ Reed Business Information, Inc.